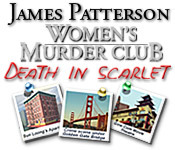 Overview: Based on the best selling book series, Women's Murder Club by James Patterson's, this game takes you inside the lives of three woman (as opposed to the four in the books although you will see Jill inbetween levels) who fight crime. The series was also a short lived television show in 2007-2008 on ABC which was not picked for a second season. However, even if you don't know anything about the books or show, you're sure to love this great murder mystery type game which brings together puzzles and hidden object genre's. 2. not everyone will get the same combination, the combination below is an example only! 2. use the Backlight to look for blood. From here on out I think you can finish the game on your own… beware for a surprise ending! Content(s) of this game guide may not be copied or published on any other site without permission from Casual Game Guides. Please feel free to share the link to this guide with others.